Experience the full taste of espressos, cappuccinos and lattes! 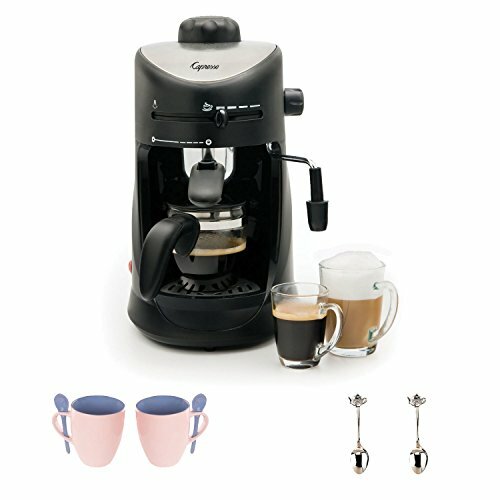 The Capresso 4-Cup Espresso & Cappuccino Machine features an exclusive Coffee/Steam selector that makes it easy to control both brewing and steaming, allowing the user to adjust coffee strength to their personal taste. The steam boiler principle of the Capresso 4 Cup Espresso & Cappuccino Machine heats up water and then starts forcing the hot water through the filter holder and brewing espresso coffee into the glass carafe. During this time steam starts collecting in the boiler. When the coffee has reached the bottom line marking on the glass carafe, you can stop the brewing and switch to frothing milk. At that time the machine has created maximum amount of steam. When you finish frothing, turn the selector switch back to the coffee brewing position.